Kamui and his group try to locate the Sibyl System by overloading the network, by using the stolen Dominators on a group of 500 hostages. Kasei realizes the goal and orders Akane to kill Kamui by setting off a detonation that would kill all the hostages, pushing Akane further by showing her pictures of her grandmother's murder scene (actual scenes not visible in the episode). 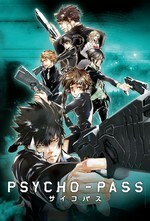 While hesitating over what she should do, Kogami appears in Akane's conscience, helping her find another path besides murder. Akane gets into contact with Kamui to free the hostages and give him information about Sibyl's location, when Kasei breaks into the video call and tries to force Akane to kill Kamui. Akane stands firm and states her plans. While Kamui manages to stop the detonation and releases the hostages, Togane finds Akane and says he must avenge his mother. Akane tells him she has deduced his true nature and goal, just as Kamui appears before them. Togane pulls out a knife, while Kamui prepares to fire his Dominator at Togane, ending in a cliff-hanger. I've read a few places how reviewers are complaining how S1>S2 but I disagreed because they both set out to be *different* stories. Although, it annoys me how the creators handled Akane's grandmother because it's borderline fridging a minor character as a plot device when there's better ways to motivate characters. I liked the imaginary meeting w/Kougami and Akane which was nicely done esp. since she had a challenging problem and no decent choices. He's important but at the same time he's not exactly telling Akane everything she *must* do to solve the problem.